As we all get older, it’s inevitable that we will need more care. Some of us will need short term or long term care. Here in Hawai‘i, specifically Maui, we are very fortunate to have care facilities like Hale Makua (Kahului and Wailuku), foster care homes (2–3 clients), and care homes (5- or more clients). Hale Makua alone has various programs to offer. For instance, they have Health Day Care Program similar to babysitting for adults. They have Health Rehab where they offer physical therapy, and MEP—Maintenance Exercise Program. This month’s featured Sakada Offspring is none other than Angelina (Angie) Saiki. She is a registered nurse at Hale Makua, Kahului. She was born in San Lorenzo, San Nicolas, Ilocos Norte, Philippines on August 31, 1956. She is the only child of the late Francisco and Abelina Ribao Agustin. She was raised by her mother and grandmother, the late Simeona Ribao because her father was in Hawai‘i. She claimed she was a little spoiled by her mom and grandma and that she took advantage of it. Angie attended Bingao Elementary School, Holy Spirit Academy of San Nicolas and Municipal High School, in San Nicolas. Later, she attended Far Eastern University in Manila emphasizing Pre-nursing courses. 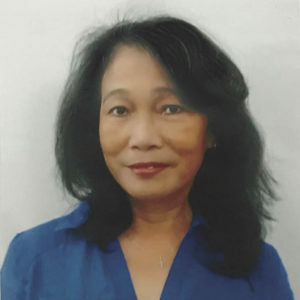 After Far Eastern University, she attended St. Anne’s School of Nursing in Makati and proceeded to Arellano University in Manila, where she received her Bachelor of Science in Nursing degree. After her college graduation in 1978, Angie came to Hawai‘i to be with her Dad, Francisco. 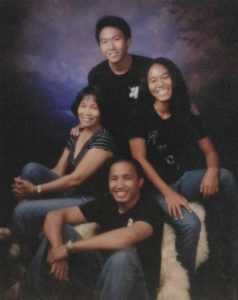 She was scheduled to come to Hawai‘i earlier right after high school but things did not work out and she preferred to remain in the big city of Manila to attend college. Angie’s father, Francisco was born in Hawai‘i in 1929. 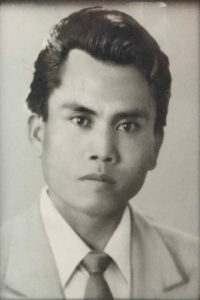 His parents were Jaime and Francisca Agustin who came to Hawai‘i from the Philippines in 1928. They worked at the Del Monte Corporation in Kunia, O‘ahu. 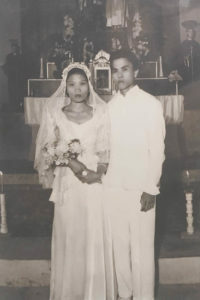 Because of the hardship in raising a family, Francisca Agustin (Angie’s grandmother) decided to go back to the Philippines and took seven year old Francisco along in 1936. However, when Francisco turned 29 years old, he came back to Hawai‘i with not much trouble because he was a Hawai‘i citizen by birth. He was already married to Angie’s mother, Abelina, and Angie was already three years old. Because she was only three years old, her mother described to her when she was older about her dad’s coming to Hawai‘i—walking to the ship on a wooden plank and throwing colorful crepe paper ribbons to them which signified to them to go and follow the “rainbows of life” and for “greener pastures” in Hawai‘i. What an imagery for a little child! He left the Philippines via Manila Harbor on the S.S. President Wilson. His sea voyage lasted fourteen days before reaching Hawai‘i. Upon arriving in Hawai‘i, Francisco worked at the Del Monte Corporation in Kunia, O‘ahu like his parents did. He retired as a pineapple planter there. He was well known as the “best planter” and “Union Representative.” He also enjoyed raising chickens and playing cards. Francisco passed away on December 21, 2014 with compassionate care of Angie’s stepmom, Mansing at his side. Sometimes our lives unpredictably take us to a different course beyond our control. When Angie left the Philippines, she left behind a boyfriend whom she adored and loved and they were planning to get married someday after he graduated from college. However, when she arrived in Hawai‘i, she met another young man, Arsenio Bagay. Unfortunately, their marriage did not work out. Arsenio moved back to the Philippines and died there in 1998. They had a son, Dennis Bagay. Dennis Bagay is married to Rachel Esteban. They have two children, Ember (7) and Branden (3). Dennis is the Manager, Slot Department, at Planet Hollywood Hotel and Casino in Las Vegas, Nevada. He is finishing his Masters Degree in Hotel Marketing/Public Administration at Washington State University. Michael-Kelly Saiki is an Assistant Manager, Slot Department at Bally’s/Harrah’s Hotel and Casino in Las Vegas, Nevada. He graduated from U.H. Mānoa with a Bachelor of Science degree, majoring in Economics. Michele-Kay Saiki is a U.S. Army Reserve Sgt. (Combat Medic). She completed Pre-nursing pre-requisite classes at U.H. Mānoa and is exploring which university to continue her nursing career. She once worked at Blood Bank of Hawai‘i and she is currently employed at Castle Medical Center on O‘ahu in the Lab Department. She is presently registered at Kapiolani Community College to continue her nursing career. In 1980, Angie was hired as a Bedside Nurse/CNA at Hale Makua Kahului. A few years after that, she passed her LPN License followed by her RN License in Hawai‘i. She has been working at a caregiving compassionate environment for more than thirty-eight years at Hale Makua, Kahului. She was also employed at Kaiser Wailuku as a part-time Lab Assistant for a few years. Presently, Angie is a RN Case Manager with Case Management Professionals, Inc. She visits foster homes, care homes, who render passionate care to the elderly to make sure continuity of excellent care is done in the community. She is also an RN Evaluator of the State of Hawai‘i, Clinical Instructor at U.H. Maui College, Nursing Department. Although Angie is a very busy person, she still finds time to help in the church community of Christ The King in Kahului. She’s been a Religious Education Catechist since 2002 until present. She takes care of the First Communion Candidate Students. 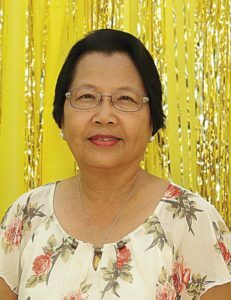 She serves as a Lector and a member of the Cancer Ministry, Sacred Heart Society, Rosary and Bible sharing group and a Core member of the MBCC—Maui Basic Christian Community which directs and facilitates religious retreats.